Justin Timberlake To Reunite With N*Sync At MTV Video Music Awards 2013? The 'Cry Me A River' singer will apparently be joined by his former bandmates after receiving his special Michael Jackson award. Justin Timberlake could reunite with his old N*Sync bandmates at this weekend's MTV Video Music Awards 2013, it has been reported. The New York Post claims that the 'SexyBack' star will join forces with Chris Kirkpatrick, JC Chasez, Lance Bass and Joey Fatone for the first time in more than ten years. The publication claims all five stars will come together to celebrate Justin picking up the Michael Jackson Video Vanguard Award, for his contributions to music. 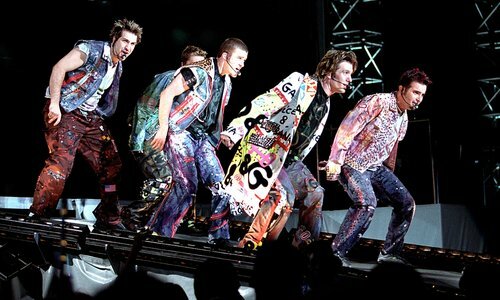 The star is expected to pay homage to his illustrious career during his performance and N*Sync hold one of the standout moments from VMA history when they were joined by Michael Jackson at the 2001 event. It's also believed members of N*Sync were seen hanging out with Justin in the VIP area on his final 'Legends Of The Summer' outing with Jay-Z this past weekend. Justin and other members of N*Sync have continued to downplay rumours of a reunion with the group not even attending his wedding to Jessica Biel last year. The group disbanded in 2002 when Justin launched his solo career. Meanwhile, Justin will also be releasing his new album 'The 20/20 Experience Pt. 2' next month.